Skin cancer is a matter that shouldn’t be taken lightly. It’s estimated that around 5.4 million individuals are affected by skin cancer every year in the United States alone. Make sure you’re appropriately protecting your skin and your health to avoid this common, yet serious, diagnosis. Knowing the reality behind these myths will help you better protect yourself from the dangers of skin cancer. Many assume sunscreen is only needed on hot and sunny days, like those spent at the beach. But this simply isn’t true. The truth is, sunscreen should be applied every day. According to the Skin Cancer Foundation, 80% of the sun’s ultraviolent (UV) rays pass through clouds. Similarly, snow can reflect up to 80% of UV rays, increasing your risk of damaged skin. Sunscreen works to protect your skin from the sun’s harmful rays. Proper protection from the sun reduces your risk of premature aging, wrinkles, sun spots, and skin cancer. However, if you don’t apply sunscreen properly, you won’t receive appropriate protection. Make sure you’re thoroughly applying sunscreen every day—no matter the weather—to maintain healthy skin. Another large misconception many have about sun protection is this idea of a base tan. Many assume that if their skin has a slight tan, or a base tan, it will protect their skin from getting damaged from the sun. This is far from the truth. A tan of any kind should not be mistaken as protection from the sun. A tan is your body’s way of telling you it’s damaged. The change in color of your skin tone is caused by an increased production of melanin, or pigment. Your skin produces pigment as a defense mechanism, to protect your cells from further damage. However, this protection equates to a sun protection factor (SPF) of only three or less. This is not enough protection from the sun. As a rule of thumb, we recommend having a minimum of SPF 30 on your skin at all times. Another common misconception about skin cancer is that any growth can be removed before it becomes cancerous. Unfortunately, this is not true. If recognized and treated early, most growths are curable. However, if patients don’t recognize and treat growths within a timely matter, they run the risk of developing skin cancer. Similarly, if a skin cancer growth isn’t treated appropriately, it can advance and spread to other parts of the body, becoming difficult to treat, and in some cases, fatal. A (Asymmetry): Draw a line through the middle of the growth. If the two sides do not match, it’s considered to be asymmetrical. This is a warning sign of skin cancer. B (Border): A benign, or cancer-free, growth will have smooth and even borders. A cancerous mole, freckle, or spot will have scalloped or notched edges. C (Color): Most non-cancerous growths are a single shade of brown, whereas cancerous spots contain a variety of colors. D (Diameter): Benign freckles, moles, or spots usually have a smaller diameter compared to growths that are considered cancerous. E (Evolving): Common and benign growths look the same over time. Cancerous growths will change, or evolve, their size, shape, color, or elevation at any time. The sun’s ultra-violet rays are the most common cause of skin cancer. One study estimates that around 86% of skin cancer can be attributed to UV ray exposure. 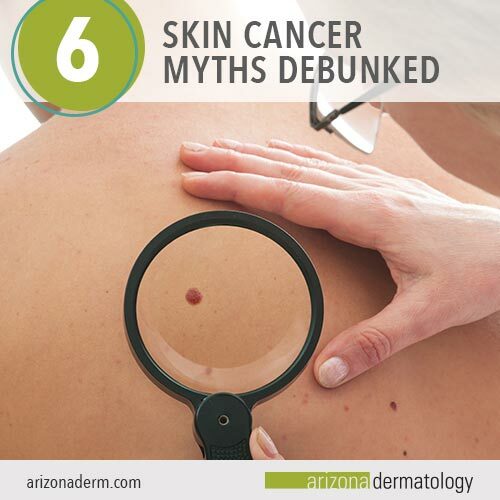 But, contrary to popular belief, the sun is not the only cause of skin cancer. Certain skin cancers are caused by factors other than UV rays, including genetics and environmental influences. Stanford Health Care states that around 5-10% of melanoma cases, the most dangerous type of skin cancer, are inherited in an autosomal dominate fashion. Meaning, parents that have been previously impacted by melanoma, have a 50/50 chance of passing it to their children, regardless of gender. Because of this reality, it’s important to constantly monitor your skin for any abnormal changes in tone or texture, even if you were to stay out of the sun. Many patients with dark skin tones often believe they’re not at risk for skin cancer. However, this is a common and dangerous misconception. All skin types are vulnerable to skin cancer, regardless of race, tone, ethnicity, or texture. Darker skin produces more pigment, or melanin, which helps protect skin—but only to a certain extent. Patients with darker skin tones can still get sunburned and develop skin cancer from UV damage. Because of this, we recommend applying sun protection and monitoring your skin, regardless of your natural skin tone. If you still have last summer’s bottle of sunscreen laying around your house, there are several things wrong. First, if you lasted an entire year without running out of sunscreen, you’re likely not applying enough. When applying the right amount of sunscreen daily, you should run through several bottles of sunscreen throughout the year. Second, if you have leftover sunscreen, using last year’s bottle is not ideal. Many ingredients used within sunscreen dry up and expire over time. Depending on how old your bottle is, the ingredients may not be effective, leaving your skin unprotected without you even knowing it. To combat this issue, be sure to check the expiration date on the bottle of your sunscreen before application. Don’t get burned by these common skin cancer myths. Stay educated on the reality of skin cancer to better protect your health and your skin. If you’re still left with questions or concerns about skin cancer, don’t hesitate to contact us at Arizona Dermatology. We’re experts in the field of skin cancer and will help you in the journey to healthy, protected skin.